Trans-Tasman Resources Limited (TTR) is a New Zealand based and managed company established in 2007 to explore and develop New Zealand’s offshore mineral sand deposits. In 2016 TTR’s most advanced project is the South Taranaki Bight (STB) iron sands project located 22km to 36km offshore from Patea. The Company also has a granted Prospecting Permit covering potential high grade (>10%HM) heavy mineral sand deposits offshore the West Coast of the South Island containing ilmenite, zircon, rutile, garnet and gold similar to the onshore Barrytown deposit. The STB project has reported JORC iron sand mineral resources of 1,698Mt @ 11.16% Fe2O3 for the Mine Area and adjacent Kupe Blocks at a 3.5% Davis Tube Recovery (DTR) cutoff and a further 2,137Mt @ 9.66% Fe2O3 for Stage 2 Block mine areas. These resources, in 25 to 60 metres of water, are located within New Zealand’s territorial 12 nautical mile limit (RMA) and the Exclusive Economic Zone (EEZ). The STB project pre feasibility study (PFS) is based on dredging 50Mt of iron sand each year, separating around 10% titano-magnetite from the sediment offshore, and returning 90% of the sand to the seabed backfilling mined areas. The sands will be processed offshore aboard a purpose built 345 metre integrated mining vessel (IMV). This vessel is designed to operate through almost all known weather conditions in the STB. The iron sand will be extracted by remote controlled 450t seabed crawlers, excavating up to 8,000t hour, similar to those operated by DeBeers Marine offshore Namibia to recover diamonds. The IMV will have a purpose built metallurgical processing plant on board producing 5Mt titano-magnetite concentrate a year grading around 56.5% Fe2O3. The concentrate, initially stored on the IMV, will be transferred as slurry to the trans-shipment vessel (TSV), dewatered and loaded into Cape Size export vessels using dry bulk ship-to-ship loading systems and shipped directly to world markets. The STB project PFS indicates the operation will add to the diversification of the Taranaki economy and generate local, regional and national economic benefits through employment and training, royalties, and taxes. Locally, approximately 300 direct jobs will be created, over 1,600 nationally and $350m spent on operating costs every year. Since inception TTR has spent more than $65 million on defining the resource potential, environmental assessment of the proposed mining areas and possible impacts of the mining, mine engineering and process design, ore marketing and the processing and shipping operations associated with the resource extraction and iron sands export operations in the South Taranaki Bight. Trans-Tasman has made a significant investment in, and commitment to, the development of its offshore South Taranaki iron sands mining project. The Company remains committed to securing EPA marine consent to facilitate the financing, construction and commissioning of this technologically advanced tier one world class marine mining operation. The project will deliver substantial economic benefits to New Zealand whilst employing the world’s best practice with sustainable environmental outcomes. On 21 September 2018 TTR lodged a notice to the Court of Appeal to seek leave to appeal the HighCourt judgement of 28 August 2018 regarding our marine consents for the STB iron sands project. 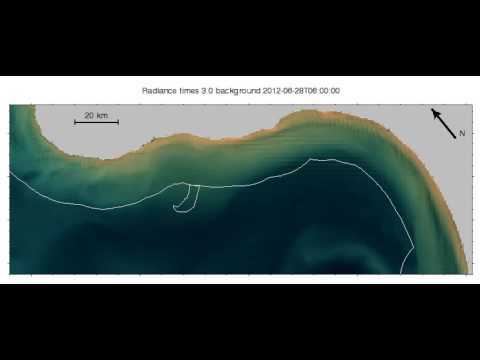 The following videos were created as part of the modelling exercise carried out by NIWA. Although referenced in the modelling report they were not regarded as pertinent by either TTR’s or the EPA’s independent peer reviewers to the evaluation of the effects of the plume. It is important to note that despite not being included in TTR’s Marine Consent Application, as with all other references, they were always available to anyone requesting them. In light of a request by some submitters, TTR has included these videos on our website with the hope that the additional perspective will assist some submitters in visually understanding the dynamic nature of the background suspended sediments and the effect that the proposed project will have on the naturally occurring sediment plumes.